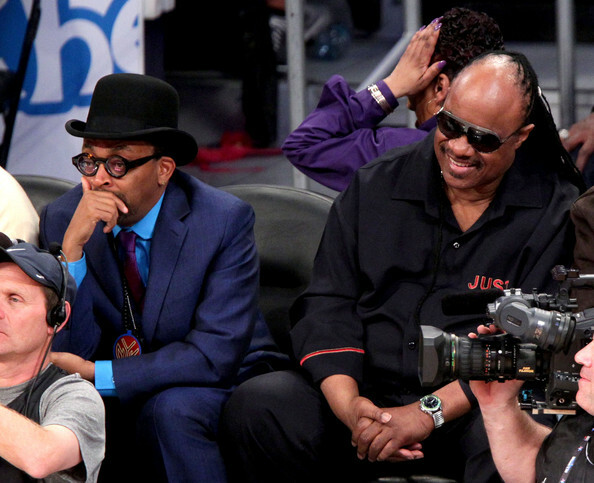 Director Spike Lee (L) and singer Stevie Wonder sit in the audience during the 2011 NBA All-Star game at Staples Center on February 20, 2011 in Los Angeles, California. NOTE TO USER: User expressly acknowledges and agrees that, by downloading and or using this photograph, User is consenting to the terms and conditions of the Getty Images License Agreement. Director Spike Lee cheers for the Knicks while wearing a black bowler hat.